With Dreamforce18 the following week, would Salesforce.com purchase the last great independent marketing automation firm? During LeadMD’s PR meeting the Tuesday before the announcement, we seriously considered releasing a speculative article about our bets on an acquirer. How does Diego know this? Who cares! And then, Marketo made their announcement. As quickly as our “Marketo M&A Watch” began, it ended. RIP. 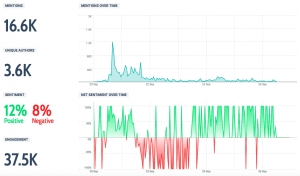 Chatter around Marketo spiked and most of it, according to Talkwalker, was positive. Just a day later, LeadMD’s CEO, Justin Gray, was quickly providing opinions on the acquisition. We’re really opinionated about Marketo acquisitions. 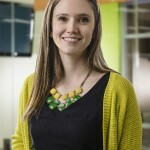 For our take on their acquisition of Bizible earlier in the year, click here. AdWeek wrote about the acquisition in their article Adobe’s $4.75 Billion Purchase of Marketo Will Boast Its Ability to Compete with Salesforce. 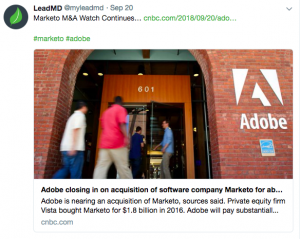 Justin Gray, CEO of LeadMD, is a long-time partner of Marketo and offered his assessment of the pairing by claiming that Adobe’s stewardship could be a “shot in the arm” for Marketo as the b-to-b specialist had “fallen off from innovation pace” in recent years. He said the pairing of Adobe’s creative tools suite along with the Marketo platform will let the b-to-b specialist extend its buyer engagement mission by better integrating into online buyer behavior via Adobe experience manager. “The true innovation potential, however, lies in the coupling of Marketo and Adobe’s AI product, Sensei, in order to make the powerful platform more accessible,” he added. ClickZ’s take in their article By acquiring Marketo, Adobe moves beyond B2C focused on the B2B sector implications. 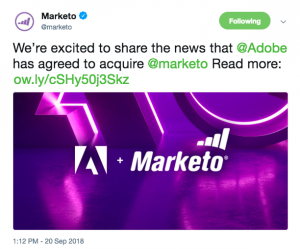 Demand Gen Report covered the news and infused it with a few ideas from MarTech leaders in their article, Adobe to Acquire Marketo for $4.75 Billion.